Haier’s sudden launch into the portable consumer electronics market with the new Theatre HV3A, is certainly a surprise considering that the company is primarily a home appliance manufacturer. The Theatre is an ambitious little device, being the first in Haier’s line of media players with a touch screen and a built in accelerometer. Let’s proceed to break down each aspect of the player and give a final rundown on whether or not this product is worth its hype. The first thing that stands out about the Theatre is its uncanny resemblance to the iPod Touch and iPhone. Haier has managed to create a player that is as aesthetically pleasing as its Apple counter-parts. With a glossy black back-finish and metallic looking front-screen framing, the theatre is in no way a flimsy media player. The exterior casing is solid which makes taking it apart a considerable effort. The Theatre’s small dimensions are particularly advantageous as the player easily fits into one’s pocket or any space that size. The sturdy casing combined with the small size makes the it less prone to bending and breaking. Although it doesn’t get a lot of points for originality, the Theatre’s sturdiness makes up for the lack of creativity in its design. The highlight feature of the Theatre is its 3 inch touch screen. Although the idea of navigating through the UI with a touch screen sounds novel, the Theatre’s touch screen can be pretty unresponsive. First, sliding through each sub-menu can be incredibly frustrating, because one may end up selecting a category instead of just scrolling. I did get used to it with some practice, however, and moving through each of the menus became relatively simple. The most common button in each subcategory (music, video, radio, etc.) is the back button. This makes navigation a lot easier, as pressing the back button allows you to reach the main menu via the stroke of one button. One major complaint, however, is the way files are organized in the different categories. Going to Videos shows all the same folders uploaded onto the device as it does for Photos. This means that in order to get to an individual photo, one has to search through all the folders uploaded onto the device. The Music section is the only exception to this, as it organizes songs by artist, album, etc. like most players do. USB 2.0 makes transferring media to the device easier. The device shows up as a standard mass storage drive, so all that needs to be done is a simple drag and drop. 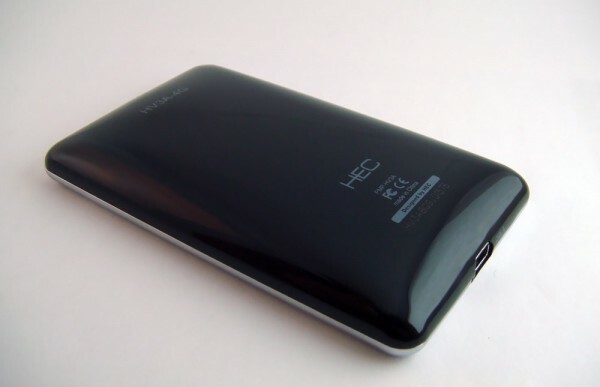 On its website, Haier says the battery can deliver up to 12 hours of audio and 3.5 hours of video playback. When I put the player to the test, however, it did not deliver on either of those, it was quite the opposite. The maximum battery life I was able to get was 2 hours 30 minutes when running the player on just audio. The player lasted for only an hour when I used just the video playback feature. Obviously, this is nowhere near the amount indicated by Haier. After the player died, I recharged the battery, and tested audio playback again. The results were even worse the second time around: The player died on me in less than an hour. Every time I took the player out with me I had to bring the USB cable along just in case it died. 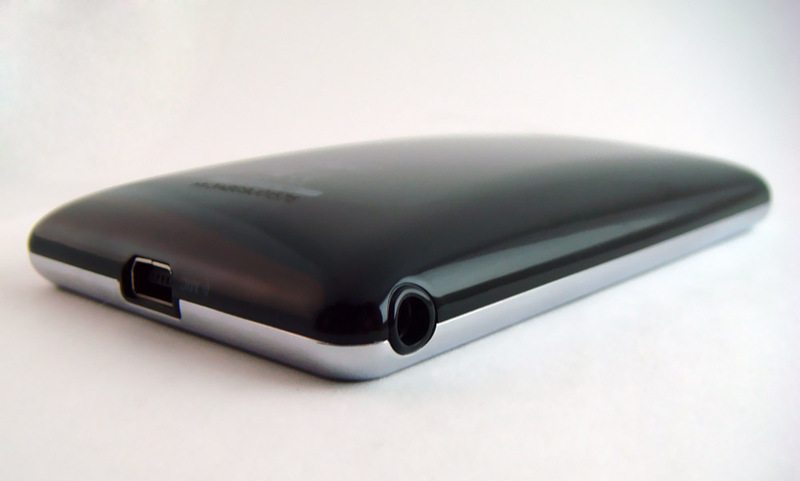 Delivering on battery life is one of the most important aspects of any portable device, the Theatre didn’t do the job. The FM Radio is possibly one of the best features of the Theatre, and provides for a relatively clear and enjoyable listening experience. One immediate drawback is the lack of availability of some local stations at times. However, most of the stations that the receiver picked up sounded crystal clear. I tested it both indoors and outdoors, and there was no noticeable difference between the sound qualities. The player managed to pick up both mid-range and low frequencies fairly well which is surprising considering many radios have issues delivering bass. The radio comes with the capability to record and playback songs heard on the radio. This is especially useful if you want to record a song you like. That way, you can go home and find out more info about that song, like the name, artist, album etc. The FM Radio serves its function quite well and is definitely one of the more solid features that the Theatre has to offer. Music playback is one of the expected features of any multimedia device. And apart from the FM radio, music playback is the Theatre’s most robust feature. If it weren’t for some annoying aspects of the UI and the player’s menial battery life, there would be relatively few things to complain about with regards to the actual listening experience. One interesting thing I noticed though is that the device seemed to be picking up extra noise. This was indistinguishable when actually listening to something; however, with nothing playing, the noise was definitely noticeable. Some key features of playback include the ability to loop segments of a song, change equalizer settings, and shake the player to toggle through songs. Each song shows its file extension as well as its album and artist names. Every song shows its album artwork which is a plus; however, the designers have sacrificed some space for the actual controls like play, pause, next, and previous by doing this. The small controls are made worse by the fact that the touch screen isn’t as responsive as it could be. There frequently were times when I pressed the wrong button due to the buttons being so small. The equalizer comes with standard presets and also the ability to turn on heavy bass frequencies. The video player on the Theatre is extremely frustrating. One of the codecs that Haier says the video player supports is MPEG4. In reality, however, the player does not readily accept this format, and the actual native format used by the device is WMV. I therefore spent a good amount of time figuring out why it wasn’t playing the MPEG4’s I was transferring onto it. It turns out that in the instruction manual mini disc provided, there is also software given to convert different video formats to the WMV format which is what the player actually is able to play. 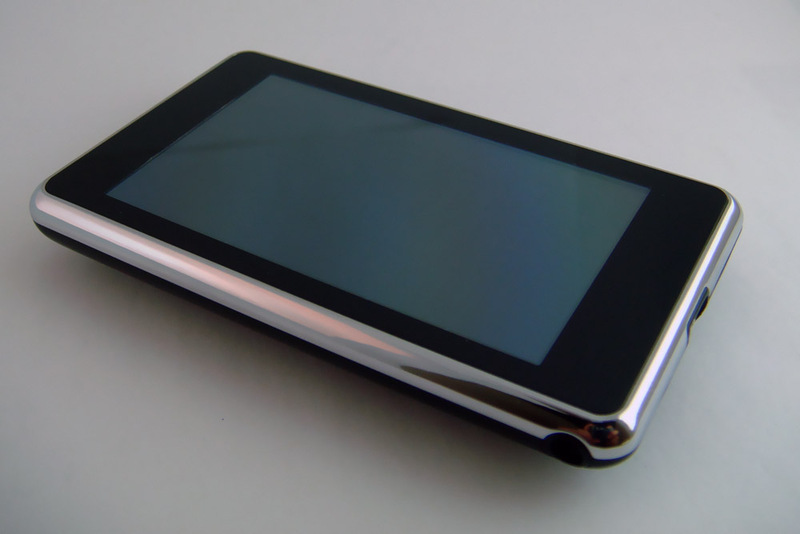 Regarding video playback feature, the quality of the video is not on par with that of other devices with similar features, like the iPod Touch. The image is fuzzy and the frame rate drops frequently causing abrupt pauses in playback. The small screen size makes it hard to distinguish between objects and videos. As far as viewing photos is concerned, the experience is definitely better than the one with video playback. Pictures look a lot crisper, especially when rotating the device for a widescreen view. Although photos look considerably better than videos, it’s hard to see why one would limit oneself to viewing photos on this device. The Theatre comes with the feature to upload TXT files and read them through the Ebook section. While in theory this is a nice idea, it is quite difficult to read text on such a compact device, and after some time, the strain on most people’s eyes will deter them from this feature. It’s great for someone who doesn’t mind reading such small print and scrolling through large TXT documents on such a small screen, but for anyone else this feature is impractical. The player also comes with an extras section contains a stopwatch and a calendar, both of which could be useful on the go. Right out of the packaging, the Theatre seemed like an appealing device. However, as I began to play around with it, my initial impression went from being impressed to somewhat annoyed. But my opinion of the device flipped again, as some of the features grew on me with extended usage. The features that really stood out were the FM Radio, music playback, and the overall physical design of the player. Those features were the exception. The Theatre still needs a lot of work on important features like battery life, video playback, and the UI. Although it isn’t as polished as an iPod Touch or similar higher-end video player, the Theatre is a great mid-range option.